I fished a morning “Kids Fish, Too!” trip with Mr. Allan E. and his 4 boys, 12 year old Josh, 10 year old Chris, 8 year old Merrill, and 4 year old “Little O.” I generally don’t take more than 3 kids at a time, but, with a little proactive discussion with the boys dad, we agreed that I’d look after the older 3 while dad did some 1-on-1 with Little O., and that worked out very well for us. From L to R: Josh, Chris, Merrill, Allan, and Little O. with the best of the bunch of the white bass we landed this morning. One of the first 5 fish we landed regurgitated this small “combo platter” consisting of a young shad (center) and a freshwater shrimp (bottom). The Pet Spoon (top) is a nearly dead-on imitation for the young of the year forage size. Air Temp: 78F at trip’s start, heading towards the high-90’s. Wind: Winds were calm to 2 or 3 mph from the S and SW. Skies: Skies were clear and bright with clouds slowly building in the south, but which never reached our area until after the trip concluded. The name of the game today was downrigging. We got on the water shortly after sunrise and thanks to the flat calm conditions, there wasn’t a single fish breaking water anywhere to be seen. We scanned a few areas very quickly with sonar looking for congregations of bait, and found a bit of bait and some gamefish in 24-27 feet of water over a 30-40 foot bottom from Area 040 to Area 517. I coached the boys on their roles to keep our operation efficient (meaning lines nearly constantly in the water) and to keep each young man engaged. 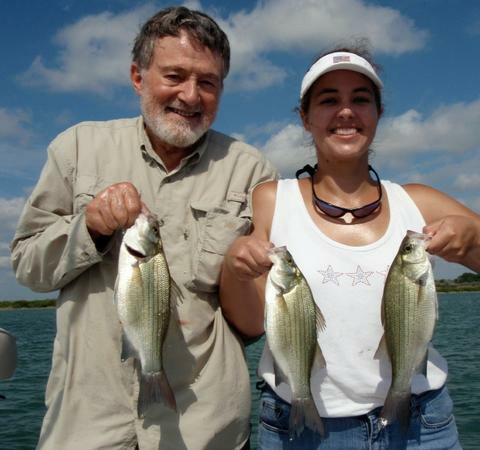 One would peel out the right amount of line behind the boat, another would lower the downrigger ball, and another would adjust the “skimmer rod” for surface-oriented fish. Once we had “fish on”, one boy would fight the fish, one would raise the downrigger ball and get ready to reset, and one would clear the skimmer to avoid any tangles. The boys took turns bringing in the fish so everyone shared equally in the success. We landed 9 fish (8 white bass and 1 drum) here including a tandem (two fish on one rod) for Little O., but eventually the fish and bait disappeared. We headed to between Area 484 and 205 and caught 12 more fish here including 2 drum and 10 white bass. When things went soft here we moved on. We headed to between Area 444 and 644 and picked up 2 white bass when I spotted a dense school of fish on bottom in about 24 feet of water. I knew we could cast to these fish and catch them more efficiently than via downrigging, so, we set up to cast with the boat in a hover. I demonstrated the lift drop technique to the boys and caught a white bass while doing so, then they followed my example and landed 2 whites and a small largemouth before the school moved on. We returned to downrigging and put a final 14 fish in the boat by 10:15am, including 2 more drum, 1 more largemouth (keeper sized) and 11 white bass, including our second tandem of the day. By now the novelty was wearing off and the boys’ attention span had about played out, plus the building heat and lack of breeze made it pretty warm, especially with them wearing life jackets. Dad and I agreed this was a good stopping point, so we brought our lines in and headed back in. As we did, we made a special effort just for Little O. who, because of his age, didn’t get to do all the stuff the big boys did. We rigged up a pole for Little O. with a quill float and worm and hit a small colony of sunfish at Area 239. In less than 15 minutes’ time we landed an additional 13 sunfish, all of which were bluegills. The older boys were good sports to patiently wait on their little brother to do this. We finished up by snapping a few photos of our 4 largest white bass at dockside and then safely released them, as well. On Saturday, June 26th, I welcomed 10 year old Joel Crowley, his 8 year old sister, Hannah, and their mom, Sharon, for our sixth S.K.I.F.F. trip of the year. We chose Stillhouse Hollow at the destination for this excursion. I recently met with Chaplain Bill Shelnutt, the Religious Education Coordinator for all of Ft. Hood, concerning offering trips to those families he ministers to whose mom or dad is deployed. The Crowley’s are the first family I’ve had the privilege of fishing with as a result of that meeting. Husband and dad, Bob Crowley is a chaplain (rank of major) with the Third Armored Corps now stationed in Baghdad, Iraq, until approx. January of 2011. We began our trip at 6:15am with the customary safety briefing and then headed out to look for fish just as the sun began to rise. Lately, I’ve encountered some fair topwater action on school-sized largemouth bass pursuing young-of-the-year-shad early in the morning. We did a “listening halt” over an expanse of water where some topwater action had been occurring earlier in the week, but, we didn’t find much and so headed to search out fish in deeper water using downrigging equipment. We found fish with the downriggers consistently holding at around 24 feet from Area 484 to Area 206 and caught them consistently from 7:00am through 8:40am. 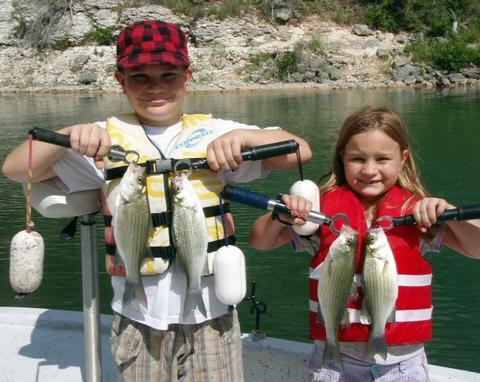 During this time, we used a tandem rig with a Lunker Licker spoon up front and a Pet Spoon behind to catch 21 fish including white bass, freshwater drum, and largemouth bass. At one point, Miss Hannah caught two fish at the same time — one on each spoon!! She would appreciate me letting you know she also caught a “yellow hat fish” (which blew off her head at 30 mph) and a “brown weed fish”. When this action got soft, I moved us and found heavy concentrations of white bass in the bottom 3-4 feet of the water column along the bottom of an old creek bed in 47 feet of water (Area 650). This school of fish was spread over a 30 yard area, so, we put the trolling motor down and hovered over these fish and used a “smoking” technique to catch fish after fish on jigging spoons before the school drifted off. During this frenzy we put an additional 17 fish in the boat — all fat, healthy 13+ inch long white bass. It was now around 9:30 and the kids literally had sore, red palms from reeling in the white bass. We decided to change things up a bit and close out the trip with some sunfishing in a quiet cove (Area 231) to get out of the wind which was now ramping up to around 16 mph or so. In about 40 minutes’ time, using simple slip cork rigs and worms, the kids landed 8 sunfish which included bluegill, longear sunfish, and green sunfish. Around 10:30 we snapped a few photos of our largest 4 white bass and returned them to the water, then headed back to the dock. I presented the kids each with a SKIFF tacklebox, a SKIFF ballcap, and a SKIFF t-shirt and bid them farewell. Our total catch this trip was 46 fish. Mrs. Crowley was very appreciative to all of us for offering this to her family. She’s asked me for your mailing address so she can send a note to all of you. I’ll keep you posted when we get trip #7 lined up. Until then, thank you for your support and for making this opportunity available to our Ft. Hood kids! P.S. 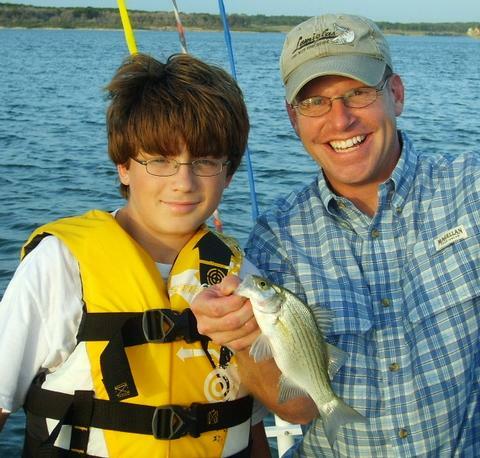 I’ve included 2 photos, one of the kids with their 4 largest white bass of the day, and one of a portion of the big school of whites we found on sonar. Air Temp: 77F at trip’s start, heading towards the high-90’s. Wind: Winds were S4 at sunrise, slowly swinging and tapering up to SSW14-16 by trip’s end. Skies: Skies were clear and bright with 25% cloud cover. 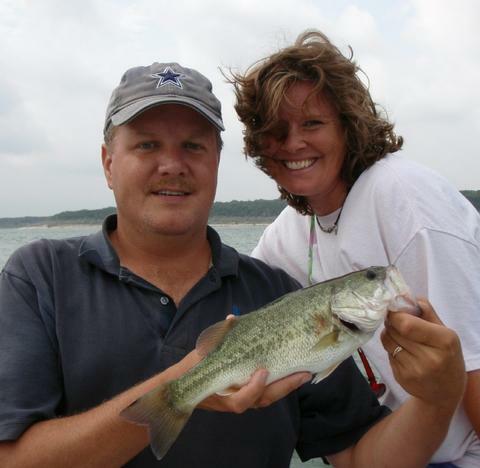 I fished a half-day morning trip with returning guests Jim and Shena S. of the Austin area. We experienced typical summertime fare today including some topwater action, some action from deepwater white bass, and some action from suspended gamefish on downriggers. After everyone was aboard, we situated ourselves on the front deck and practiced a few scenarios to make sure both Jim and Shena understood the importance of quick, accurate casting, and to give them an idea of their own casting range with the rigs we were using. With that accomplished, we headed out to search for topwater action and found very little happening despite fairly favorable conditions. Then, like someone turned on a switch, at 7:45am, schools of largemouth just appeared on the surface and began feeding with abandon. Jim and Shena with a few of the whites taken from a deepwater school on chrome bladebaits — the nickel/silver Cicada. The surface was glassy calm and the sun was bright by this time, so fooling these bass was no easy task. Jim and Shena kept at it, throwing at all the fish they found within range, and, one by one, the fish began coming over the side of the boat after falling for the Cork Rig. As I worked the trolling motor and observed sonar, I noted a lot more fish suspended than were showing on the surface, so, despite some limited success on top (3 bass landed to this point at Area 481), we changed gears and transitioned to the use of bladebaits fished lift-drop style and were quickly and well-rewarded for our efforts. By the time the feeding spree had ended, we’d boated a total of 22 fish, most of which were very solid 13-14 inch, very thick white bass, from between Areas 517 and 480). Many of the fish we brought in regurgitated small shad as they neared the surface — further evidence of what was going on beneath the surface. Once the topwater died down and became just sporadic, we switched over to downrigging for the remainder of the trip. Keying on the forage size we observed, we included small Pet Spoons in our spread and lowered the balls to an average of 23 feet over water from 25 to 40 feet deep. We worked an area from Area 205 to 444 up through about 10:40 and landed a nice mixed bag of white bass, freshwater drum, and largemouth when things began to soften. At this time I pointed out to Jim and Shena the rather abrupt change in the forage fishes’ orientation. They had gone from being in tight, suspended balls and clouds, to a relaxed state, nearly blanketing the bottom in the lower 2-4 feet of the water column. This usually signifies the beginning of the end of the feed in the summer months, and, indeed, the action here tapered quickly over the next 15-20 minutes to near nothing. We made one final move west to see if we could put a two-fish finishing touch on a 48 fish trip. We idled into Area 056 and some gamefish began popping on sonar, again, at 23-24 feet down. The bait was scarce, but what bait there was was still balled up tight — not a bad sign. We got ‘rigger balls down and over a 25 minute span came up with 3 more fish — 2 white bass and a largemouth. I knew we’d reached the point of diminishing returns now, so, with 51 fish boated and the temperature steadily heading for the 90’s, we called it a day and headed back to the dock. Wind: Winds were around 4SSE at sunrise, then slowly turned SSW and built to around 8 by trip’s end. Skies: Skies were clear and bright with a briefly lingering bank of clouds in the E just post-sunrise. 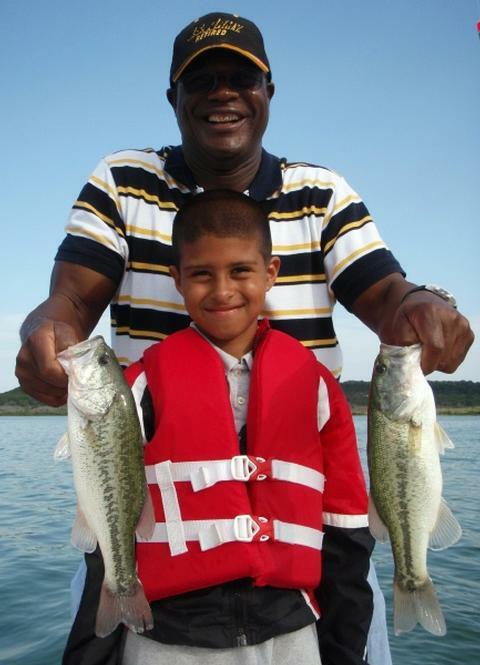 I fished a half-day morning trip with grandpa Waymon Y. of Copperas Cove, and his 8 year old grandson, Xavier. 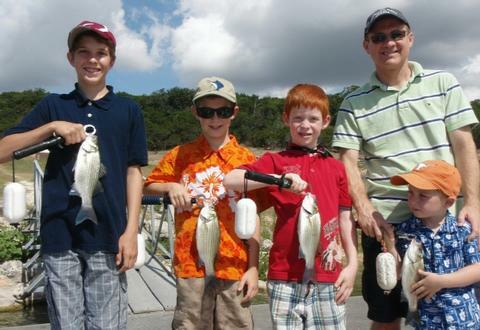 Neither had done just a whole lot of fishing prior to this excursion, and most of that was limited to bank fishing in the ponds around Central Texas College. Waymon and Xavier hit it just right today — over 2 hours of topwater action!! Fortunately, we ran into some fairly intense topwater feeding at and around Area 061 not requiring long casts, although speed and accuracy, as always, enhanced success. Both learned on the fly and were both catching fish consistently as long as the topwater lasted, which, today extended from about 7:15am to 9:20am. During this feed the boys landed 16 fish, all on the Cork Rig. 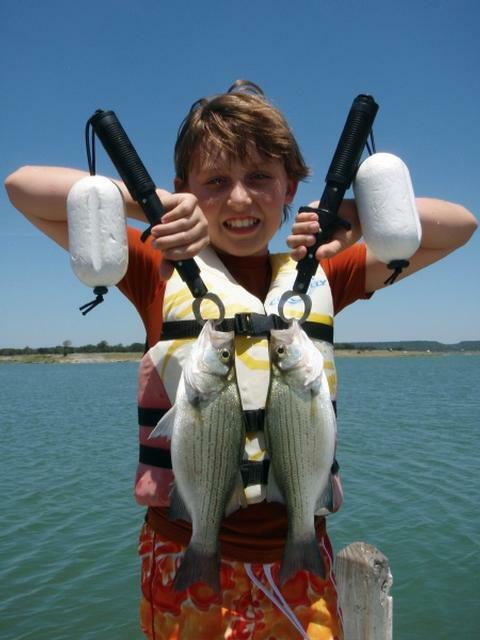 Their catch consisted of a 40/60 split of black bass/white bass. Once the topwater settled down, I introduced them to downrigging. We focused on a section of lake bounded by Area 485 and Area 206 and stayed on top of the fish an bait for about 45 minutes until that, too, settled down. While these fish were feeding, we caught them very consistently, landing 14 fish in this short span of time, including a mix of white bass and freshwater drum, all on Pet Spoons in a Pet/Licker combination. In order to finish up the trip on a positive, and engaging note, we decided to head shallow to Area 231 to fish for sunfish with floats and bait here. We found nice bright, calm conditions and the water here in good shape with rock, timber, and aquatic vegetation making a nice haven for sunfish. We baited up and in no time flat boated 11 sunfish including longears, greens, and bluegills. Once the fish here “got smart” and stopped biting, we wrapped it up and headed to the dock. Wind: Winds were around 6SE at sunrise, then slowly turned SSW and built to around 10-12 by trip’s end. Skies: Skies were hazy with the typical low cloud bank in the E around sunrise. I was joined again today by Chris and 11 year old Cooper K. on their 2nd annual Fathers’ Day outing together with me. Chris operates the Georgetown “Catfish Parlour” which is closed on Mondays, so it gave him a great opportunity to enjoy a bit of summer vacation with his son while avoiding the noise and traffic of the weekend lake scene. 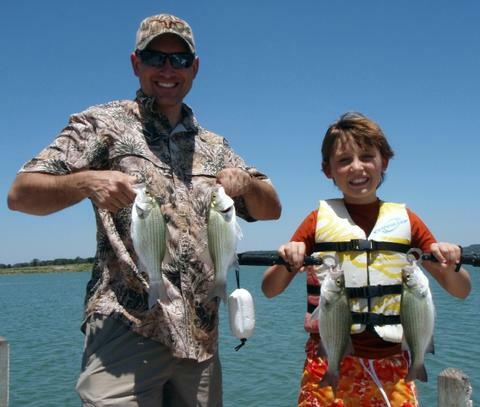 Father and son with our best 4 white bass of the day, all taken around 24 feet on Pet Spoons. Cooper set out lures, lowered the ‘rigger balls, adjusted depth, and more all to get our presentations just right. Then came the payoff! Wind: Winds were SSE4 at sunrise, slowly swinging and tapering up to SSW12 by trip’s end. Before launching out, as we got familiar with all the gear at dockside, Cooper used a slipfloat to target a few sunfish he spotted in the water, and wound up catching 5 sunfish and a black-tailed shiner in no time flat. Once we pushed off, things really started slowly for us today when, despite pretty decent conditions for topwater action, we saw only 2 decent schools of bass appear topside around Area 061, and then only for a few seconds. Following that, the winds went slack for a good while which always makes things tough. We checked 4 different areas looking for fish and bait until we came across the right combination on sonar between Areas 444 and 644 . Even so, with the wind near calm, we passed over a lot of inactive fish to comb out a few takers. In this area, we saw spare, small schools of white with a predominance of solo drum hanging out at mid-depths. They responded well once the winds came up a bit and remained blowing in a sustained fashion. For our efforts here we boated 1 white bass and 7 drum bringing our tally up to 14 fish. We considered some livebait fishing, but I didn’t find any significant largemouth presence on some reliable breaklines, so we pressed on. We headed to Area 646 and found some scattered whites, but no bait. We again moved, this time to between Areas 056 and 649. As we motored in here things started looking really good with ample bait showing in a threatened posture, and schooled white bass mixed right in with the bait. For the next 2 hours we worked these fish over at between 22 and 25 feet over a 25 to 32 foot bottom. The fish stayed willing to bite this entire time, allowing us to boat 23 white bass, a drum, and the day’s only largemouth bass, all in this general vicinity. Twice we had father-son doubles on, and, to end the trip, Cooper successfully landed a tandem (two fish on one rod) on the Pet/Licker combo. As we eased back next to the courtesy dock, Cooper asked if he could harass the sunfish a little bit more. I obliged as I got the truck backed down and the boat cleaned up. He wound up landing two more lively black-tails in no time flat. At that point we called it a day and agreed that “better a slow start and a strong finish than vice versa”. 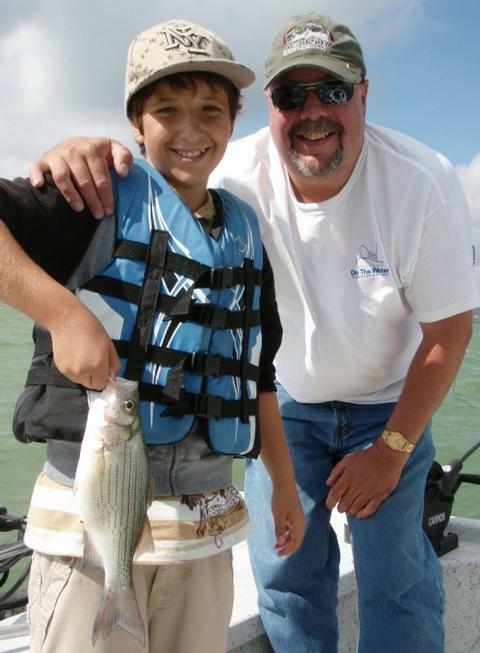 I fished a morning “Kids Fish, Too!” trip today with Ethan R. and his grandfather, Butch. Butch traveled in from Fall River, MA, to visit his family here and surprised 11 year old Ethan with this fishing trip. The fish were a bit sluggish today, and once again we encountered some pretty tough winds, but, by the time all was said and done we put together a pretty good bag for our efforts. Grandpa Butch and Ethan with one of our larger white bass taken by downrigging today. Ethan and his first fish of the day taken on topwater. Air Temp: 76F at trip’s start, heading towards the mid-90’s. Wind: Winds were SSE8 at sunrise, slowly tapering up to S19 by trip’s end. Skies: Skies were ~30% cloudy and fair in the breaks. We started out today looking and listening around Area 061 for any topwater action we could find. Right around 6:45, we began to see largemouth in small wolfpacks of 3-6 fish each popping up over open water. We got Ethan positioned on the casting deck and, with some dockside practice fresh under his belt, got him in range of some action. He hooked up with a small largemouth with a big attitude on just his second (very accurate!) cast. I thought this was going to be a good deal — surface feeding fish and a kid who could cast well — but, it wasn’t to be. The surface feeding just shut down after a sparse 10 minutes or so and never redeveloped before the winds started pushing whitecaps. We then looked over a few areas looking for schooled white bass to jig for. As Ethan got the hang of “slabbing” he landed a drum at Area 205 and lost one other fish at Area 463, but, all in all, the slab bite was pretty soft today. We then began targeting the suspended, scattered fish we’d seen in two different areas, and found some willing fish at Area 645. With balls set at 23-25 feet we combed this area very thoroughly and put 9 fish in the boat — all white bass — including two sets of doubles on the Pet/Licker tandem rig. Once this played out we ran the same program from Area 148 to Area 648 and put 3 more fish in the boat here by around 11am. Ethan was a huge help in maximizing our “lures in the water” time as he rigged the lines and dropped the balls down for me after very quickly getting the hang of those skills. Before finishing up the trip, we gave shallow water sunfish a try at Area 200 before calling it a day. 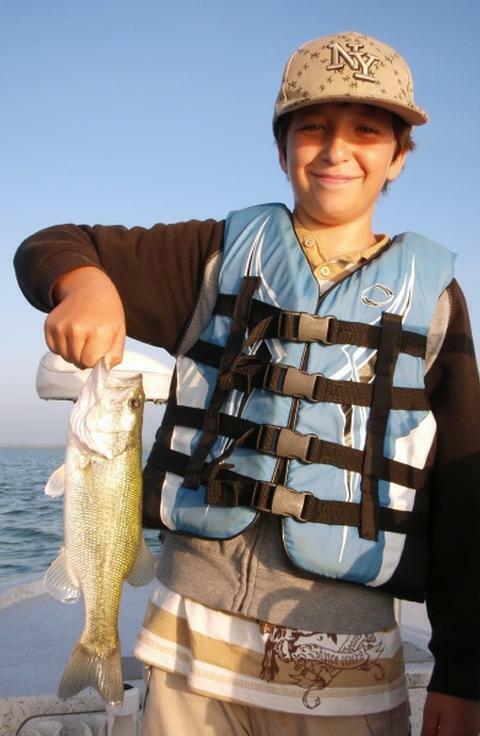 Ethan used an ultralight spinning rig with a slipfloat and wore out the sunfish pretty thoroughly. In less than 30 minutes he boated 11 sunfish consisting of small bluegill, green sunfish, and longear sunfish. Ethan finished up today boating 26 fish for his efforts. By the time we got back to the dock he looked ready for some grub, some A/C, and a good ol’ afternoon nap! 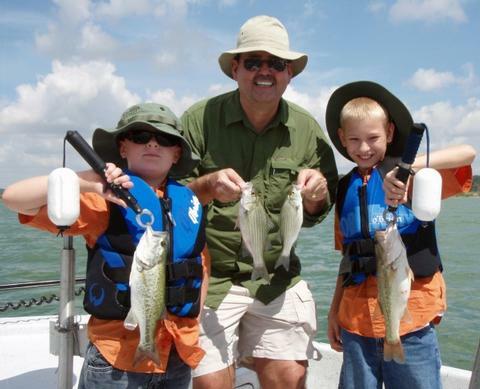 I had the pleasure of fishing with returning guests Jack and Jay B. and their dad, David, all of Temple. The boys are now 8 and 10 years old. Last time they came out with me dad and I did a lot of casting, hooking, and handing fish off to the boys. This time, they did it “all by themselves” and they did well. Topwater fishing this time of year requires fast, accurate casting. The boys did well with Cork Rigs used on spinning gear. In all, the 3 of them landed 22 largemouth and missed another 3-4 right at boatside before the surface action came to a halt. Wind: Winds were S6 at sunrise, slowly tapering up to S14 by trip’s end under the influence of high pressure. Skies: Skies were ~30% cloudy with blue in the breaks under the influence of high pressure. We finally got some high pressure in along with some fishable wind speeds, and the fish responded well. We enjoyed light topwater action until 9:23am spread from Area 479 thru Area 061, to Area 468 all on Cork Rigs. This accounted for 22 largemouth. We then downrigged for nearly the remainder of our trip, taking fish at Area 460 to Area 217, and from Area 039 to the north by about 100 yards. During this time we picked up 12 white bass and 2 largemouth. 13 fish came on Pets and 1 came on the Licker in a tandem catch on the tandem rig. We ended the trip on the east side of Area 777 fishing some protected water for sunfish. We landed 2 longears and 2 bluegills on slipfloats and then called it a day. I fished a solo scouting trip this morning trying to nail down some decent topwater locations for upcoming trips. The topwater has really been inconsistent, but, then again, so has the weather. The nice high pressure dome that usually sets up over us for a majority of the summer bringing with it very stable, predictable weather conditions just hasn’t taken hold yet. I was pleased to find solid topwater action kicking off at exactly 7:05 and slowly tapering to a close by 9:15. The action came and went in spurts, but never stopped during this time span. In and around Area 061 I boated 16 fish in a 70/30 largemouth/white bass mix. All fish came on the Cork Rig and all casts had to be fast and accurate to produce. Once this action ended, I went to take a look at Area 646-647. There has been a consistent south wind blowing into this area, and I’ve seen abundant bait showing on sonar as I’ve passed by on my way to search for topwater on several occasions now. I found abundant bait, in balls, and found gamefish strung along the 23-27 foot mark, all suspended in and around this bait. I got a single downrigger working and was immediately into fish, pulling 5 whites in no time. As I moved S. toward 647, a more dense schooling of fish was seen on sonar, and, given the topography of the bottom here, these fish were closer to the bottom while still being suspended at ~23-24 feet. I hovered with the trolling motor and cast with a bladebait for about 20 minutes, landing 7 solid white bass and missing 2 more, all on a lift-drop retrieve. Once things got quiet, I made one last stop to run sonar and a downrigger over Area 056. I saw fish but not much bait in here and wound up only landing one juvenile white bass in over 20 minutes worth of effort. I wrapped it up at that point, confident that Area 061 would eventually produce consistent topwater action once the weather settles in for the long summer. Wind: Winds were around 6SE at sunrise, then slowly turned SSW and built to around 12-14 by trip’s end. Skies: Skies were hazy and with about 30% cloud over, with the typical low cloud bank in the E around sunrise. I fished a half-day morning trip this morning with returning guest Ben W. of Taylor, TX, and his wife, Carrie. Ben and Carrie with one of several largemouth taken on a fair mixed-bag trip despite high winds and difficult conditions. As we worked over a school of active white bass, this bait slick popped up on the surface. Note the “slick” round area in the center of the photo versus the rough, windblown surface surrounding it. 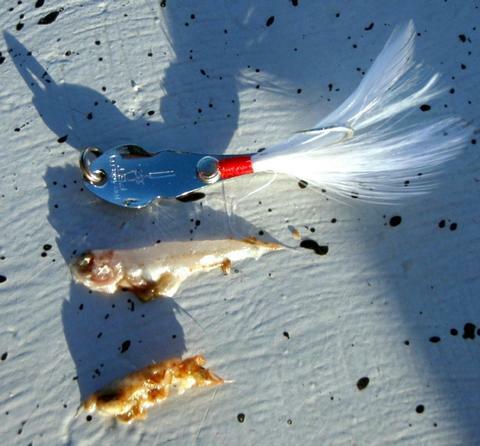 This “slick” is caused by the body oils of half-eaten baitfish floating to the surface, and indicates the presence of gamefish. Slicks are much more prevalent in saltwater but do appear for shorter spans of time in freshwater, as well. If you’re positioned directly downwind, you’ll often also smell the scent of this oil resembling something between mowed grass and watermelon rind. Air Temp: 73F at trip’s start, heading towards the mid-90’s. Wind: Winds were SSE at 10 before sunrise and increased to over 20 by 10:30am. Skies: Skies were overcast until around 11:45, then some brightening took place. We’re into the topwater season, and, when conditions are right, there has been some topwater action getting going, but, we just haven’t had many days with the right conditions, and this was one of them. As I got up to prepare for the trip around 4:15am, the wind was already blowing around 10mph, and it only increased from there, going to 20+ by around 10am and beyond. We started off looking hard at the waves to see if any topwater action was there, but, at this point in the season the fish are feeding topside on young of the year shad and only lightly sip, which is tough to spot even under ideal conditions. Bottom line: we didn’t find any surface action. Failing at that, we headed to between Areas 453 and 452, still looking for topwater, but also keeping an eye on sonar looking for downrigging potential. 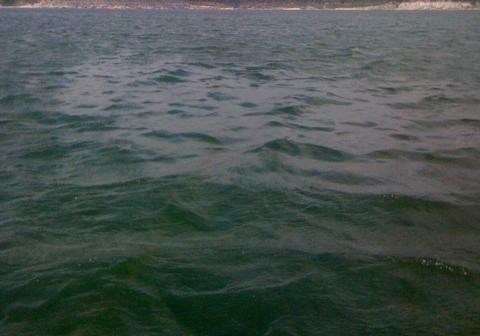 In this area we found some scattered, small white bass suspended down around 26 feet. We took a crack at these and put 3 whites and 1 largemouth in the boat for our efforts. Although the fish were scattered throughout, all of the fish we caught came from right near Area 452. We were next successful at Area 193. Right at the breakline, schooled white bass were congregated on and just off bottom on the upwind side of this feature. We began using slabs and the fish responded well, especially to a smoking technique. Both Ben and Carrie worked these fish over, putting an additional 17 fish in the boat including 16 whites on the slab, and 1 largemouth on tightlined bait. The wind increased to the point where boat control was very difficult as the action was waning, so, we headed out for calmer water. We were next successful at an 800 foot long strip of water located from just S. of Area 118, to just NW of Area 529. Here we spotted both suspended bait and gamefish around 19-25 feet and knew this was ripe for downrigging. We struggled a bit at first, putting baits over a lot of fish before hooking up with any consistency. As the murky, dark skies began to brighten the action picked up with the increasing light. We ran a single Pet on one rod and a Pet/Licker combo on the other and began catching fish with the greatest consistency from 11:45 to 1:15. On this area, we boated a total of 15 fish including 1 small crappie, 1 channel cat, 3 drum, and 10 white bass. With action slowing and the babysitter’s stint drawing to a close, we wrapped things up around 1:30p and took a “refreshing” boatride back to the dock, complete with kidney-busting waves, cool spray, and 23 mph winds. 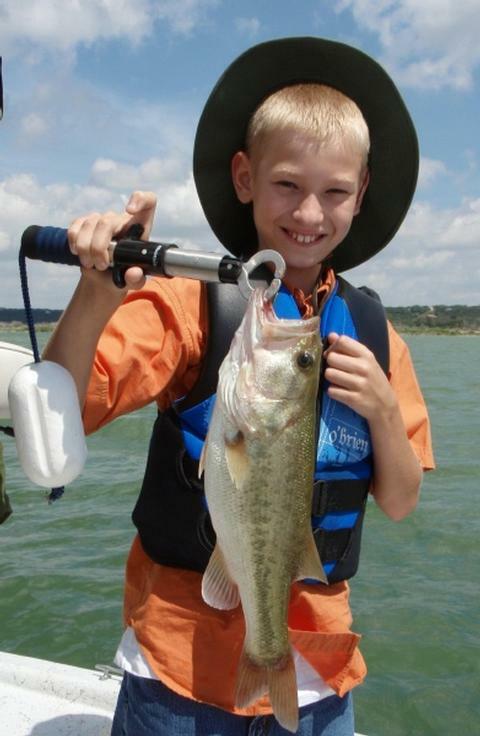 I fished an evening “Kids Fish, Too!” trip with Duane B. and his son, Dalton, as well as Dalton’s buddy, Sammy, and Sammy’s dad, Sam, all of Eddy, Tx. Both boys were 13 years old. By luck of the draw, Sammy got his licks in first picking up this white bass with a Swimmin’ Image worked down at 30 feet. 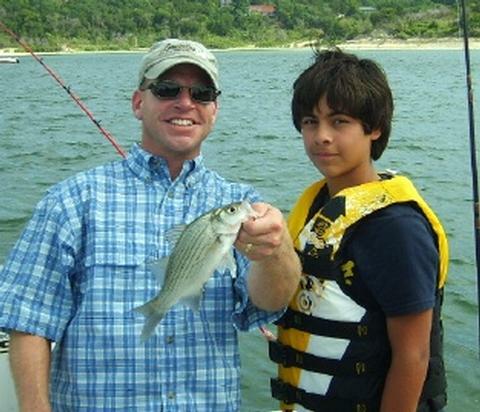 Dalton was very focused and persistent right up to the last minute, and put his share of fish in the boat including this white bass that fell for a Pet Spoon worked at ~25 feet. After fishing a morning trip this morning and experiencing a weak morning bite, and then an atypical midday bite, I was concerned that things might be tough this evening, and, with the 20+ mph winds eliminating some options, things looked even tougher before we even got on the water. As we headed out, I checked over a few areas intending to cover some water with baits down while studying sonar to try to zero in on some fish. We spotted scattered whites suspended down at exactly 30 feet out to the east of Areas 214/307 but it was tough getting a bite. As we moved in closer to shore I saw more fish, but little bait, and we did pick up one solid white bass on a Swimmin’ Image. Further passes here were unsuccessful, as were attempts at several other areas. We tried to fish Area 492, and got 4 sunfish (our intended quarry here) on slipfloats, but the wind peaked at around 24mph at this point and we had to give it up and head for calmer water. We checked several areas and even put down livebaits at one area, but still came up short. As we ran from one area to another, I spotted a briefly surfacing school of whites chasing very small shad on the surface just west of Area 447. I got us close and got the boys into the fish where we hooked 2 and landed 1 before the school sounded for good. About an hour before sunset we made our way in to Area 387/565 and fished to the channel side of a line between the two. 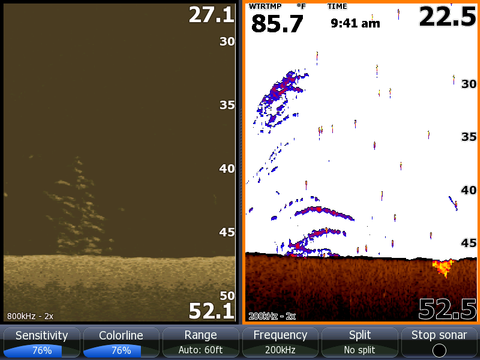 Sonar revealed a good mix of white bass and bait, suspended consistently at 25 feet. We ran twin ‘riggers over these fish for an hour plus and slowly but surely picked up white bass on a solo Pet as well as a Pet/Licker combo. Over this time we boated 7 fish here and missed two more. Action died as the sun set (which is a bit earlier than typical), and we had to settle for the hand we’d been dealt. By trip’s end we’d put 13 fish in the boat. That’s pretty tough fishing for June when, typically, things are about as consistent as they’ll be all year. I suspect that until that seasonal high pressure system sets up over Texas heating us up and drying us out and making one day’s weather nearly identical to the next, that fishing’s going to be a bit hit or miss as it’s been lately.